Re: The Monster 78, the ultimate do-it-all ski? Its back to basics for me now, Really. I sold almost everything this season. Down to a couple jackets and pants. Back to the 78 though... It really sounds like a new kind of ski. Kinda like Atomic's Metron line greatly improved. Head has really been aggressive with their ski lines and by using the Sandwich construction on wider skis, they have created a whole new concept. I can't wait to demo them. I was interested to see that Al's ski barn (thanks to Gary) was advertising them with Mojo 15's, I would think that a RF binding would be a much better choice given its front side power and ability. First things first though, I just posted a want-ad for a ski caddy for the RSII ski outing..
Hey Jim..I just checked out the 78's at Als Ski Barn...funky cool looking ski and love the dims. What length did you get and what's the turning radius? What binding is on your new boards? I was talking to Ron and I think this ski from it's spec's will open up a whole new world of ski stability and versitility for many skiers. Just like the Dynastar Contacts are winning over those Baily drinking speed demons all over the country. I like the way the ski industry is moving with these super sidecuts. With the design of this ski, the materials used...I'll bet this will really be able to handle speed and provided great control and stability as well. Kudos Jim for picking a "ripe" cherry off the tree! Now more seriously, do you have the appropriate ski colors to go with these cool looking skis? All the kids in the park will be chasing you down to check out the new ride. Man, all the ski chicks will be swamping you in the lift line.....I'm hanging tight to catch your castaways! I like the graphics better than iM77 as well.? Less like fall leaves and more like the wings of a red eagle on a brown background. I got the 177 length.? 177 would be my "normal" length for all-mountain, but I went with the 170 iM77 because of Scott's recommendation for that ski.? When his iM78 review said more forgiving than iM82 and less bull-dozer like than the iM77 then I went back to 177 for this one.? Hand flexing, the iM78 is noticeably less stiff than my i.Sl Chips (165 length) and pretty similar to the iM77.? However, the iM77 always felt like it would flex a little and then really stiffen up.? Only time will tell. Bindings are the Railflex LD12's that I took off the iM77's (Scott mounted a rail in the deal, so I guess they come flat). I have colors that mismatch (that's the appropriate computer geek thing to do).? The skis are red on brown, my jacket is blue and pants are black.? My boots do match the bindings (both are two different tones of gray).? +15 is almost exactly BOF/CRS so we will start there.? The binding mount point is slightly more forward than the iM77 (+15 there was still a bit behind BOF/CRS). I don't think all the "kids in the park" will be a problem.? Since the skis won't be in the park while they are on MY feet the kids in the park will never see them.? And, with the Ron/Michael fashion plates in the lift lines the 'ski chicks' won't be looking at anyone's skis.? ? It is kind of cool being able to see the laminates from the side, with the two layers of Liquid Metal.? I didn't realize it was an entirely new ski; I just assumed it was a narrow version of the 82, that they had so much acceptance of the 88 and then the 82 that they just decided to add another ski to the lineup down in width and up in forgiveness a little bit.? However, now that I think of it one of Scott's other comments was that it was more like a wide SuperShape. That's a perfect setup. No worries about kids in the park, its definitely not a park ski, way too narrow, Jim, we all joke about the fashion thing, but, not macthing or having all the same or similar colors is the cool thing. So no worries. 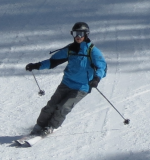 There is still the "old skier" standby of a TNF black/blue black/red jacket and black pants so don't worry! The ski is a new type of ski, its dims and performance envelope take the old Metron concept to a new level. This ski builds on the success of the sandwich SS's, 82's and 88's. Its a perfect addition to the lineup for race-bred performance with off-piste performance. If I had to guess, its probably going to be rated next season as the "perfect" one-quiver ski with a slight nod to the groomed. Gary had sent me a blurp on it where was decribed as a "freeski", I don't understand that but I do see it as a super versitile inbounds tool. Yes, I would say that all of the Head sandwich skis are in the same vein but I wouldn't say they are "wide supershapes", each has similar traits but unlike manyother ski manufacturer's, aach has its own purpose and use. Once again, I see Head leading the pack. They now have a great lineup of sandwich skis and a great lineup of cap skis. Sandwich are more on-piste, caps, better for off-piste. Where's the snow? Hmm...I might beg to differ with my collegue Ron...Jims ski in the 177 length with a 78 waist can probably ski up to knee high snow especially when moving that LD12 binding to the rear position to help keep those monster shovels above the snow. Having skied my IM77's in knee high snow, getting some backside or deep skiing should not be too arduous with the 78's unless you're in stuff deeper than the kneecaps. Whether it's a fat SS...nothing is ever really the exact same for sure, but I'm sure this ski without a doubt will have a nitch as a great one quivver ski like Ron said. The SS loves to be skied from a very centered and powerful stance to make it do your bidding. The binding is not adjustable so working off the factory set sweet spot either works for the skier or not. The 78 design may provide more flexiable ski characteristics which many skiers may look for in that one perfect ski. Where I found the Im77 not very lively compared to the 82, I think Head wisely introduced more lively into the 78 just by their structural design. Then add the shovel , tail and sidecut...based on my experience with Head, this ski has got to be a great ride. When I used my 77 as my all day ski, I had the bindings +15..when the snow got deep I went to -15 and found having this flexability with this particular ski was important. Jim, I think you should try the ski at the 3 positions just to get a feel for how it performs so that when conditions warrent, you be in the drivers seat knowing how to max out the skis performance and also find what would be less wear and tear on the body. As far going into the park....the snow is always great there...grab some sides or edges of? jumps, yep, a little air does wonders for the heart! The skis are going to be head turners! The chicks...yes flocking to Michael and Ron...well if Michael is passing out Baily shots and Ron is passing out fashion advice...yeah, I can see that. Well, with the boys new skis and fashionable colors, maybe the older woman will.....never mind...that's another blog all to itself. Now Jim, have you tucked away your new 78's safely with mulitple coats of wax on them? Gary, we are not dissagreeing about its powder ability, its just that a wider ski in powder is just easier to use and becomes more "turnier" and easier to manuever. The 78 will be fine and it will work, its just like saying the Mojo90's can carve on the hardpack, yes they can but they can't hold a candle to the SS's. Its the whole one-ski thing. Ah ha...I think when you said "super versatile inbounds ski"...it got me thinking. Yep...it is that one quivver ski thing. Not sure if the wider ski is more "turnier" but maybe being it's less energy to turn and like you said, easier to manuever. Ok...so I'm hanging on every type written word...what else do have I got to do today? Jim will be rocking on these skis for sure! BTW, I just spoke to a friend of mine who skied the "Boat" in Feb..5 feet of snow the week he was there. He did the Steamboat Powder Cat trip and said it was "way" worth the money, first class operation, great people, great food. He did the entry level one and said it was cake although he could have used more pitch due to the deeper and somewhat wetter snow condions.....lucky dog!!!! Turnier meaning much easier to turn and the ski is more "eager/willing" to turn. No edges hanging up and more surface area to leverage with. Those who have never skied a wider ski (85 or higher) need to experience this for themselves. I was a nay-sayer. The 78 wil be just fine , I am not arguing that point at all. Getting back to the one-quiver thing, I think if you are going that route, you want a "one-quiver" that meets the majority of what you ski. If you are only skiing east coast groomers, my on equiver would be my SS's or something like the Michaels Contact 11 or the new Magnum. If you are out west and ski trees and off-piste, terrain, I would take my mojo's, 88, PE or something like that. The 78 however, sounds so versitile and different, that it could have a more effective range than any other ski out there, this is why I am so psyched about it. This is killing me that I can't get on it! Me, for now, and like many here who have been converted, am still a 2 ski quivver and 2 ski outfit (warm and cold) ski nut. THis year, it proved to be just the right ticket although never really had any deep snow to test the 82's unfortunately. BUT>>>next year commeth and I'm thinking it's going to be that big snow year. I seem to get the deep stuff every 2 years so. I'm a hoping this will be the season coming. But heck...the rest is still ALL Good! A basin and Loveland I heard are open and I wonder about Killington? Still, summer skiing is on the horizon...for now and until then....its swing the club..chase the ball.